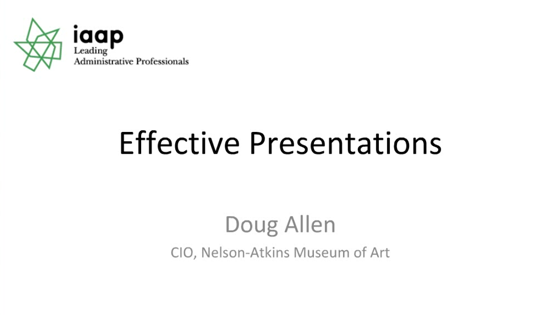 Doug Allen is the Chief Information Officer of the Nelson-Atkins Museum of Art in Kansas City. He has a degree in education from the University of Nebraska. Doug has over 30 years of experience in the Information Services industry in positions as diverse as computer programmer, hardware repair technician and networking engineer. For the past two decades, he has served as CIO for Pioneer Financial Services, Johnson County Community College and Franklin Savings and Loan. Before joining the Museum, Doug was president of Allens Consulting, a technology consulting firm in the Kansas City area. Doug has published two books, “Learning Guide to the Internet” (Sybex) and “Internet Explorer 5 At A Glance” (Microsoft Press). He has also authored several courses on a variety of personal computer technologies, including Internet Search Engines and HTML/Web Publishing. A nationally known lecturer, Doug has developed and delivered over 30 different seminars on E-Learning Technologies, Cloud Computing, Presentation Software and Internet Research. A leader in the Kansas City technology community, Doug has been a member of the Silicon Prairie Association as well as several local user groups, and he was a founding member and President of ITKC. On the national scene, Doug has served on advisory panels for Microsoft, Compaq, ComputerLand, SCT and others. Doug is a member of the Kansas City Symphony Chorus and has been seen in musical theatre productions throughout the Kansas City area.